Miles Dana, 4, jumped into the arms of his nanny Lily Barrera at the DCR&apos;s Veteran Memorial Swimming Pool at Magazine Beach park along the Charles River in Cambridge on Wednesday. Looking to escape the heat? We’ve compiled a list of local public swimming pools where you can jump in, cool off, and temporarily forget about the scorching temperatures. This list includes some — but not all — of the public swimming pools in and around Boston. Many on this list, operated by the Massachusetts Department of Conservation and Recreation, are free and no paperwork is required. Just bring your swimsuit, a towel, and some sunscreen. Many also feature wading pools and spray fountains for the little ones. 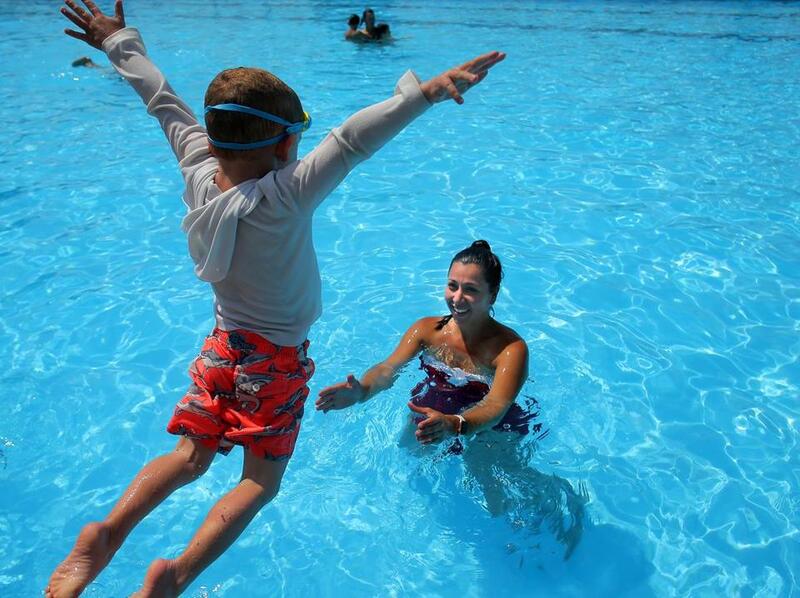 On particularly sweltering days, you can also cool off for free in community center pools operated by the Boston Center for Youth and Families. During heat advisories, they offer free swimming at community pools and the use of air conditioned facilities around the city. To find out if free swimming is available when you need to cool off, call the Boston Center for Youth and Families at 617-635-4920. When heat advisories aren’t in effect, these pools require community center membership. Prices and acceptable forms of payment vary by location and require proof of residency in the city of Boston to receive the reduced resident rate. (Non-city residents can also pay for memberships but the fees are higher.) All centers require an application form, which can be filled out online and printed out to save time when you arrive. For more information on hours, rates, and locations, visit boston.gov/community-centers.